Egg cartons are wonderful things! Not only are they made from recycled pulp and protect eggs, they are also perfect for turning into beautiful crafts. 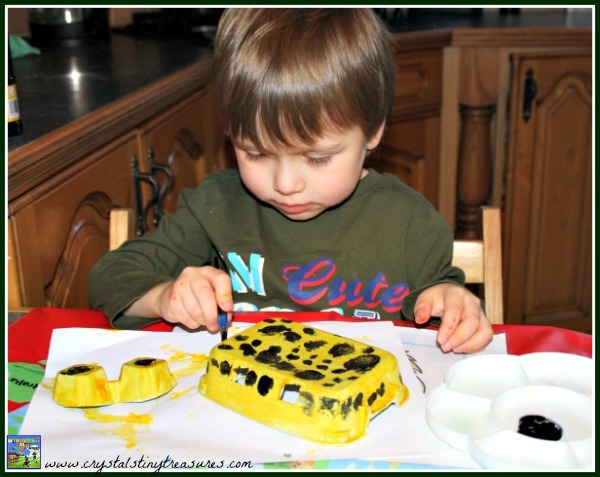 After reading We’re Roaming in The Rainforest, we were inspired to make an egg carton frog. 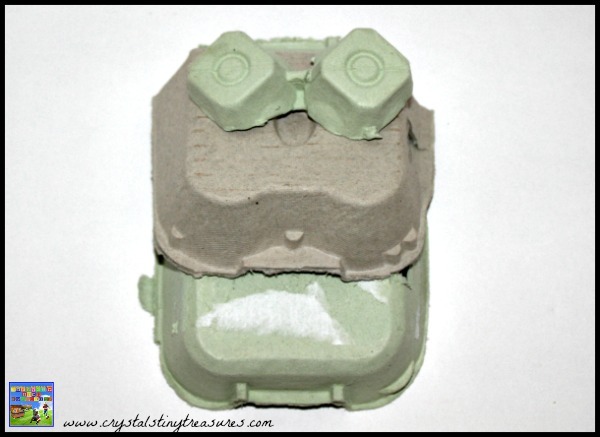 To make an egg carton frog you will need 2 egg cartons, paint, brushes, construction paper, scissors and glue. We used an egg carton that holds 6 eggs for our frog’s body. We cut half of the smooth top of the second egg carton and glued it on to the top of the body. This forms the face. Next 2 ‘cups’ were cut from the bottom of the second egg carton, keeping the join between the cups intact. This piece was glued onto the face and became the frog’s eyes. Tristan cut out 2 long rectangles from a piece of construction paper and then cut two little ‘v’ shapes into one end to form some toes. This process was repeated for the frog’s arms. However, for the arms shorter and narrower strips were cut. A similar piece of construction paper was cut for the frog’s tongue. The legs were folded at the hip, knee, and ankles. The arms were folded at the shoulders, elbows and wrists. The arms and legs were then glued into the body of the frog before the body itself was also glued closed. The tongue was glued just under the top part of the ‘face’ and using a pencil we curled it up a little (just like you curl ribbon for a gift). Now it’s ready to catch some flies! The children wanted to make a poison dart frog so they painted it yellow and added some black spots to it. This egg carton frog character has been sitting in various little spots around the house watching over us and the children have been having fun hopping around with Freddie. 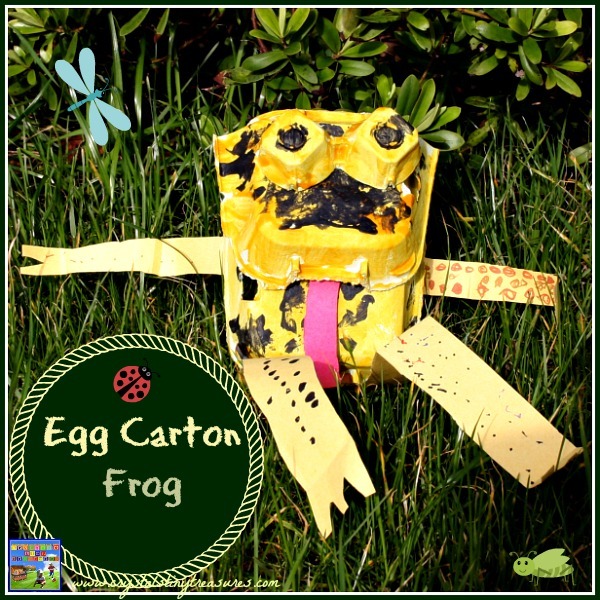 Do your children like to make crafts from egg cartons? We’ve previously made a cow, ice cream cones, and other little creations. 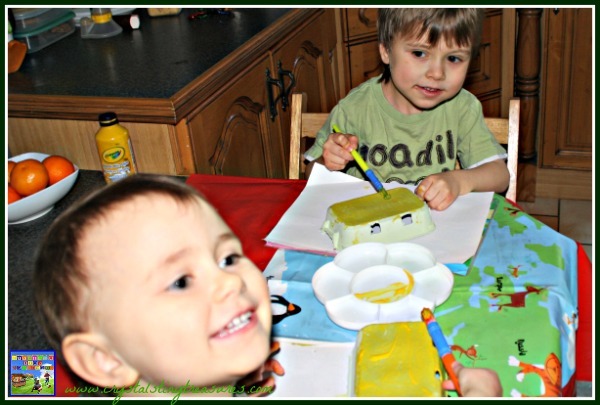 To see them all, have a look at our cardboard crafts page. And if you’d like to see our adventures raising frog spawn to frogs, you can start the adventure here. You can also learn more about the Matis of the Amazon Rainforest with a mask and dart blowers. Looks like a great project. Love crafts that are made from recycled materials! Low cost-high fun are where it’s at 🙂 Thanks for stopping by! Clever use of an egg carton. love the eyes! Thank you, the eyes do add lots of character, don’t they? 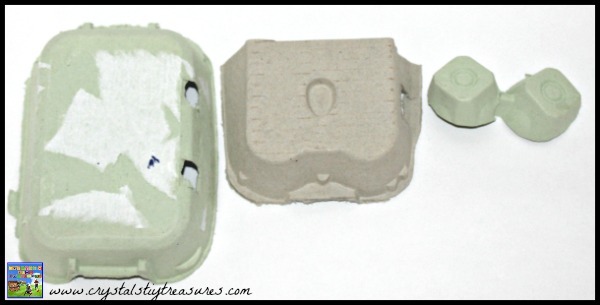 What a creative idea for re-using an egg carton – and cute too! What fun! I had thought egg cartons were pretty worthless, but you are demonstrating they can be fun to use. The frog is great! What a cute idea!! Thank you for sharing at Sharing Saturday! Thank you for hosting, as always 🙂 We love to stop by over the weekend and browse through!